Conde Hermanos guitars are played by numerous famous flamenco guitarists such as Paco de Lucia or Oscar Herreo…, but also by guitarists such as Al Di Meola, Bob Dylan etc. 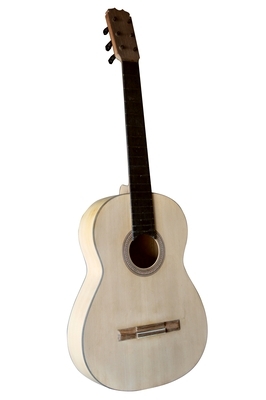 This particular instrument was made by Faustino Conde in 1963 in Madrid. 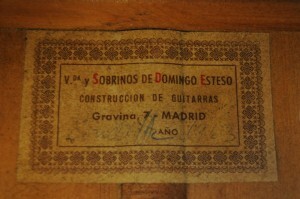 Domingo Esteso founded his company in Madrid in 1915 where he trained his nephews Faustino and Mario Conde. After the death of Domingo Esteso in 1937, the three brothers continued his legacy under the name ‘Vidua y Sobrinos de Esteso’ (the widow and nephew Esteso) until around 1960. Today Felipe and Mariano Code (sons of Mariano Conde) have taken on the company and have re-named it Conde Hermanos – Sucesores Sobrinos de Esteso. Full shellac French polish re-finish. An ugly orange cellulose lacquer was covering this ‘beautiful Spanish lady’ so I chose to remove it and re-place it with a shellac finish to bring out the tonal potential of the guitar. What is a French polish ? French polishing is technique which allows a very thin, transparent and lustrous coat of finish over a meticulously prepared surface. This finish which brings out the beauty of the wood grain is composed of natural resins. 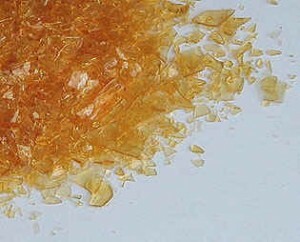 Shellac is the principal component and comes from India. It is made from the secretions of the lac beetle which are melted down, refined, filtered and broken into flakes to create its form known as shellac. 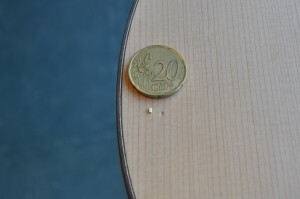 Preparation of the surface: Pore filling. In this first step, great care is needed. To remove the old varnish while preserving the integrity of the instrument is fastidious work. 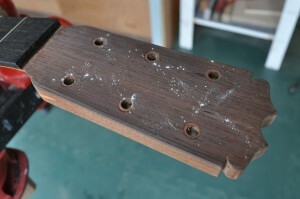 A heavy sanding would weaken the structure and damage this historical guitar. 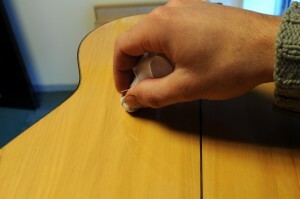 Once the old varnish has been removed there remain several dents and impact marks on the top. They have to be filled with tiny pieces of wood. They are chosen from spruce stock that closely resembles that of the top. Le petit impact sur la table et le morceau d’épicéa à gauche. Une pièce de 20 cts donne l’échelle. 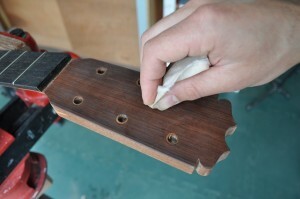 Preparation of the wood: pore filling. Certain species of wood such as rosewoods are porous. 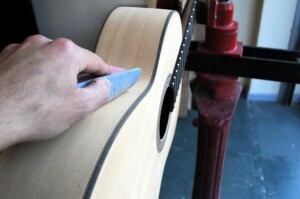 In order to obtain a perfectly flat and smooth finished surface it is firstly necessary to fill the pores of the wood. This is the pore filling process. I do this the traditional way using a cloth soaked in alcohol and pumice powder. La tête est saupoudrée de pierre ponce en poudre. Using small circular movements, the pumice powder polishes the wood and creates a paste with the alcohol that progressively fills the pores. The French polishing proper can start in earnest. It is a long process comprising of up to 30 coats spread over two months. It requires considerable experience, and rigor to achieve a perfect finish. After a week of applying two coats a day the varnish is very finely polished. I obtain an ‘iced’ matte surface. Several more weeks of alternating varnish, flattening and drying periods are called for to achieve the impressive gloss and depth of a French polish.